"Kent Bazemore #24 of the Atlanta Hawks attempts to block Drew Gooden #90 of the Washington Wizards during the first half in Game Four of the Eastern Conference Semifinals of the 2015 NBA Playoffs at Verizon Center on May11, 2015 in Washington, DC." As soon as basketball began, it ended in the district. Just as playoffs began for the Washington Wizards, they were eliminated by the Atlanta Hawks in the Eastern Conference Semifinals. It was fun to get back into the rhythm of basketball after it went missing in my workflow. And much like any other sport, the playoffs take the atmosphere to another level. From the fans, to the players on the court, and on the bench - every second and play matters. 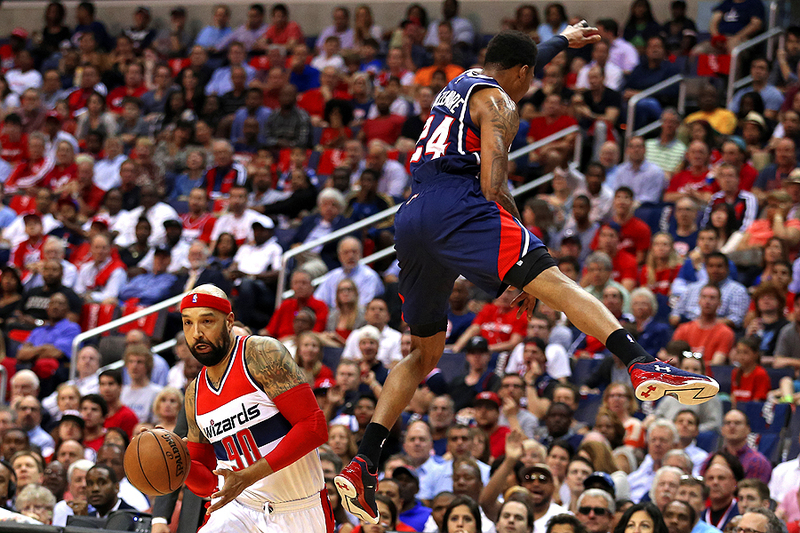 During Game Four, as the quarter was winding down, Kent Bazemore of the Hawks went to block Drew Gooden of the Wizards and miss judged the play. It sent him flying by and gave Gooden a clear path. Always interesting when players leave their feet - either into the air or to the floor. Up and downs of playoffs are always fun and I'm already looking forward to next season.